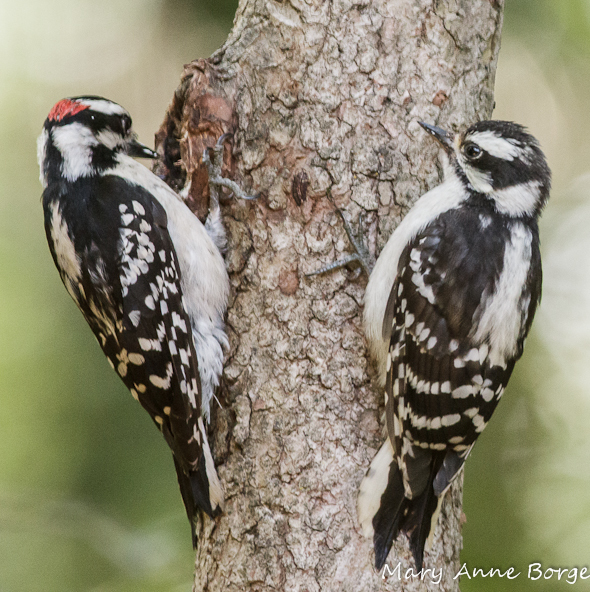 For the past week or so I’ve been watching a family of Downy Woodpeckers in my back yard. My first glimpse was of an adult female feeding an insect to one of her offspring. Since then, Mom has made herself scarce, and Dad seems to have the assignment of teaching the kids how to eat convenience food from our feeder. The male flies to the feeder for a seed, then to the trunk of a Flowering Dogwood tree where he uses the hollowed out space of a knothole to mash the seed, repeatedly pecking at it with his beak to prepare it for consumption. Sort of like using a mortar and pestle to make a paste. Once the food is properly prepared, he feeds his offspring, occasionally having a bite himself. 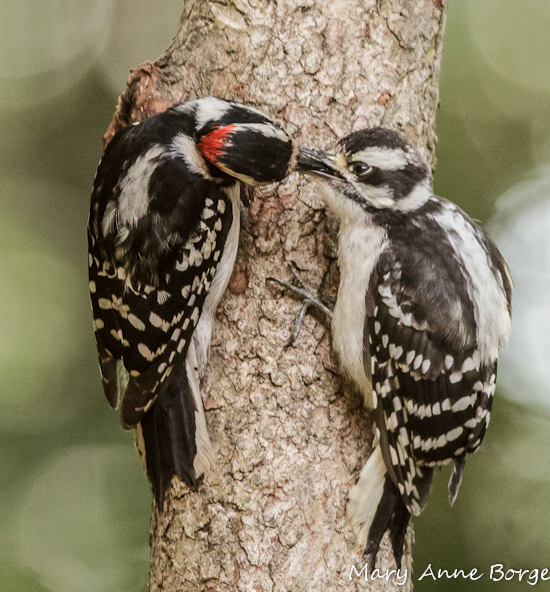 Initially I saw the adult male with just one other bird who was flying pretty confidently, so at first I thought I might be watching a mate feeding ritual between an adult male and female. 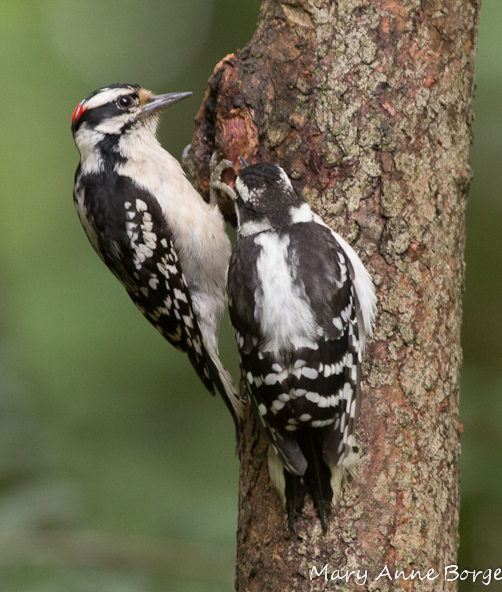 Then three Downies appeared together, an adult male in the company of two birds that were lacking the signature red patch on the back of the head that distinguishes the adult male Downy from the female and juvenile Downies. The adult male fed both of the other birds, and there wasn’t much squabbling, so I had to take a more careful look to be sure of what was going on. On closer inspection, the birds that are being fed have black plumage that is somewhat duller than the adults, the white streak above the eye is broader and ends toward the back of the head with white speckles, and there are white speckles just above the beak, characteristics of juvenile birds. Mystery solved! 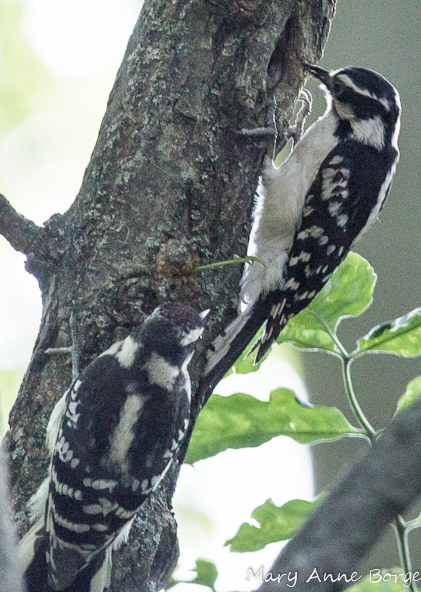 So two young Downy Woodpeckers have just about successfully fledged. They’re still looking for handouts from Mom and Dad, but they’re learning to feed themselves. To enlarge a photo, click on the image below. 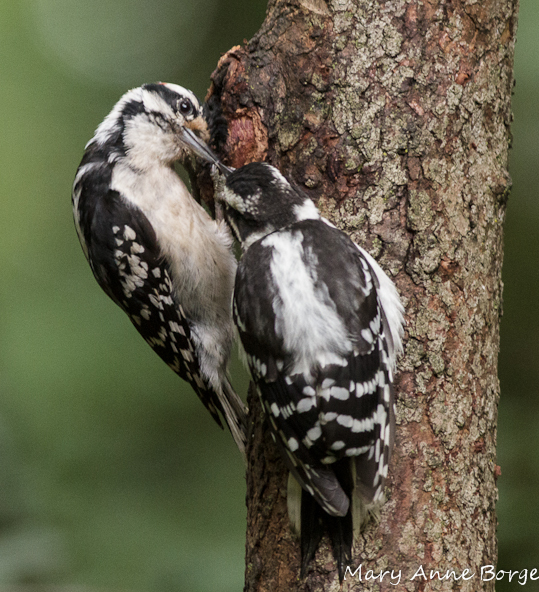 Female Downy Woodpecker feeding juvenile. Notice the hint of red on the young bird’s head. 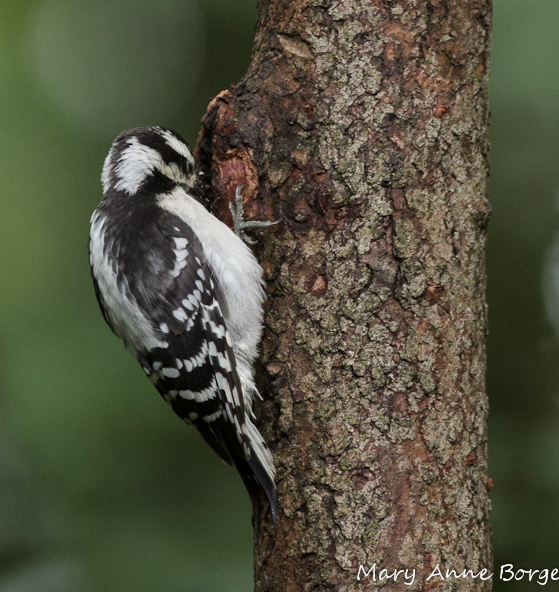 This entry was posted in Birds, Photo Galleries and tagged Downy Woodpecker, nature by Mary Anne Borge. Bookmark the permalink. Hi, I’ve just (yesterday) watched very similar behaviour by great spotted woodpeckers here at Little Paxton in Cambridgeshire (UK). I took a series (a couple of hundred) pictures, and csame to the same conclusion as yourself. I haven’t yet posted the pictures on Flickr, but should be doing so in a couple of weeks. Very exciting to see these detailed photos and observations. What a good father! Parents but no babies in our yard yet. I was surprised to see such mature fledglings so early. Yesterday I saw one of them attempting the feeder itself. There are just-hatched house wrens next door, too. Your photos are so inspiring. 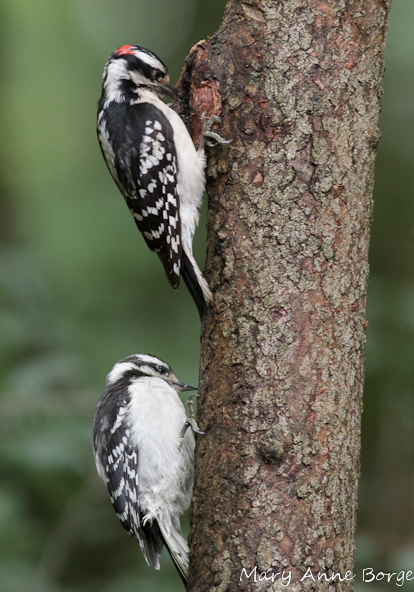 I would love to see a downy family in action. 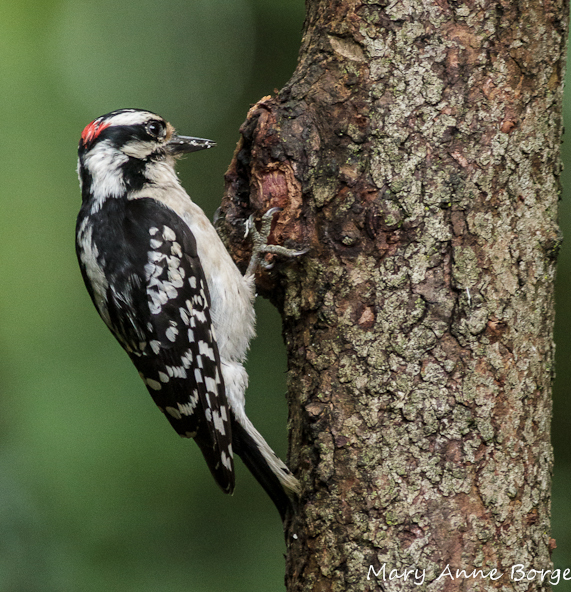 I have a downy at my feeder and I will be keeping watch in hopes of getting a glimpse of this gift of nature. Thanks, Elaine! Keep watching and I’m sure you see them. Just to be sure, though, the habitat they need for nesting is a dead tree. They excavate a hole for their nest, usually near the end of a dead snag, stub or branch. Dead trees or wood are also important food sources, since many insects may be sheltering there. 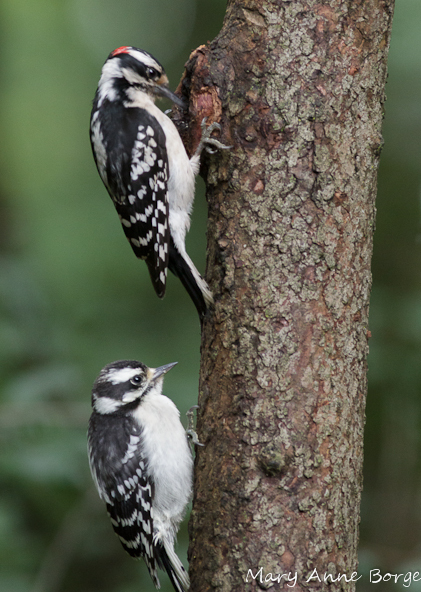 Insects provide necessary protein for birds, especially important when they are raising their young.